Each week we share insights, analysis, and opinions of the week’s transactions. Since we were out of town and unable to post at the end of this week, we’re giving you a double helping this week. To see previous posts, click here and start working back. By far, the most significant transaction was also the most arcane. 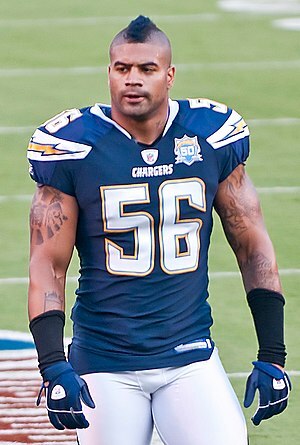 By placing OLB Shawne Merriman on a unique injured reserve list, the Chargers basically cut the three-time Pro Bowler. Merriman won defensive rookie of the year honors and was dominant for the first three years of his career, but a knee injury in 2008 sidelined him for all but one game, and he hasn’t been the same since. “Lights out” had 39 1/2 sacks in his first three seasons but has just four sacks since his knee problem. That plummeting productivity, plus Merriman’s well publicized contract disputes and off-field issues, made him a pariah in San Diego. So this move fits with GM A.J. Smith’s scorched-earth negotiating and roster-management tactics. Still, it’s stunning to see such a whimpering end for Merriman in San Diego after he had such a dominant and exhilarating start to his career. Chargers (add S Tyrone Carter and OLB Antwan Barnes, put OLB Shawne Merriman on injured reserve) – With Steve Gregory suspended, the Chargers added veteran safety Carter, who provides a veteran insurance policy in case Paul Oliver can’t hack it as a starter. Barnes, whom the Eagles traded for this offseason, got cut there, but he seems to fit a 3-4 defense like the Chargers run . He’ll fill Merriman’s roster spot. Bears (add DE Charles Grant) – The Bears added Grant, the former Saint who couldn’t catch on with the Dolphins in the preseason and was playing in the UFL. Grant is a sturdy end who has provided pass rush in the past, and if he’s ready to play he could provide presence across from Julius Peppers. Grant replaces Mark Anderson, a rookie sack sensation who hasn’t done much since. Texans (add DE Mark Anderson) – Anderson didn’t stay unemployed long, as he was snapped up by the Texans. Anderson has showed potential, but he needs to deliver. Houston helps a change of scenery will help him become a productive backup behind Mario Williams, Antonio Smith, and Adewale Ogunleye. Panthers (claim WRs David Clowney and Devin Thomas on waivers, cut WR Dwayne Jarrett) – The Panthers finally cut ties with former second-round pick Jarrett, who was a bust on the field, after he was arrested for a second DWI. In his place, they added Thomas, whom the Redskins gave up on as a second-round bust, and Clowney, who got cut in a numbers game with the Jets. Like Jarrett, Thomas is a big target, but Thomas has more speed, and for a receiver-poor team like the Panthers he’s worth a shot. Clowney is probably more of a third or fourth receiver, but he’s good enough to add depth to a team whose only proven wide receiver, Steve Smith, is out with injury right now. Saints (add RB Julius Jones, cut RB DeShawn Wynn) – With injuries keeping Pierre Thomas and Reggie Bush out, the Saints added Jones in Week 6. (Jones had been released by the Seahawks when they acquired Marshawn Lynch.) Jones replaced DeShawn Wynn and joined Ladell Betts in a fill-in backfield. Jones isn’t a special back, but he at least gets what’s there and provides a bit of a physical threat. Rams (promote WR Danario Alexander) – With Mark Clayton now out for the year, the Rams promoted Alexander to add depth at receiver. They have hopes that Alexander can develop into a contributor and not just a fill-in. Colts (add S Aaron Francisco, WR Kenny Moore) – To address injuries, the Colts added two veterans. Francisco comes in to help fill in for Melvin Bullitt, who’s out for the year with injury. Bullitt was replacing Bob Sanders, so the Colts have tapped out their depth at strong safety. Moore helps fill in for injuries that are slowing Pierre Garcon, Austin Collie, and Anthony Gonzalez. Vikings (add CB Frank Walker) – The Vikings added Walker, a veteran who has bounced around the league, to provide depth after losing Cedric Griffin to another torn ACL.